This is a pretty easy cocktail to put together. 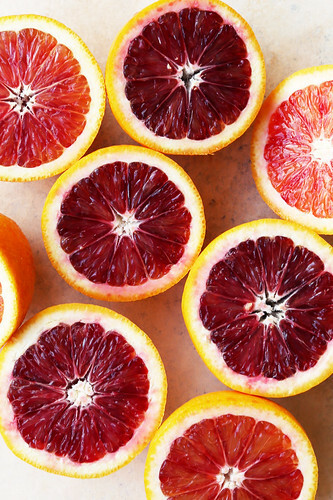 There’s a little bit of working in juicing the blood oranges, but don’t let that fool you. If that’s the most complicated step, then we’re in the clear. 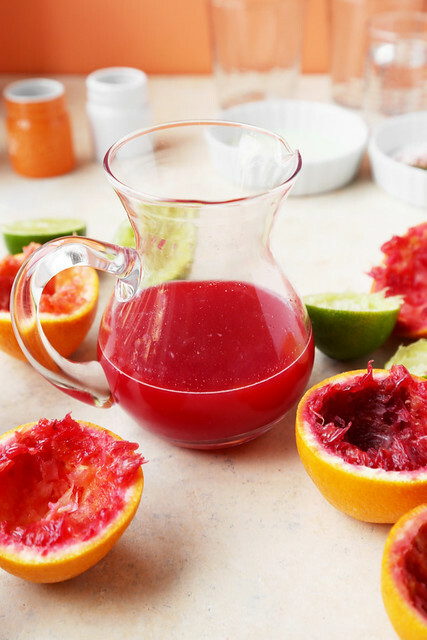 Cut the blood oranges in half and then juice each half into a bowl or pitcher. 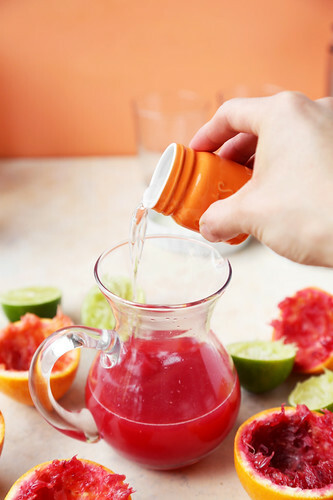 Once all of the oranges have been juiced, pour the mixture into another pitcher through a fine mesh strainer. This will get rid of the pulp for you. This is a crucial step so don’t skip it. The rest is a walk in the park from here. Just mix everything else into the pitcher. Pour in the fresh lime juice, tequila, and triple sec. Give it a good stir and then set it off to the side while you prepare in the glasses. 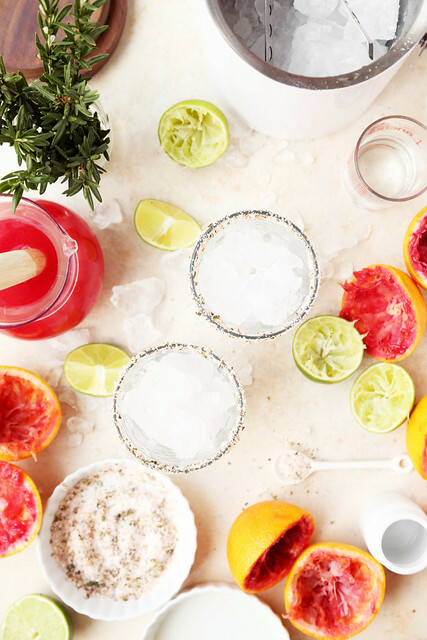 I love salt on a margarita, so we’re jazzing this one up. Giving it a make over. In a shallow dish, combine the coarse salt, cayenne pepper, and chopped rosemary. Dip each glass upside down into a separate dish of fresh lime juice, and then into salt rosemary mixture. 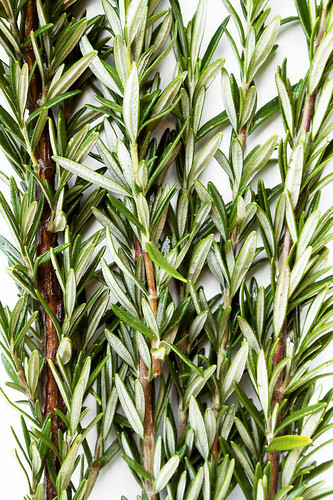 Flip the glass over and then voilà, you have a salt and rosemary (with just a touch of heat) rimmed glass. Fill the glass all the way up with lots of ice. You want these drinks to be cold. Once ready to serve, give the margarita mixture another stir and then pour it into each glass. 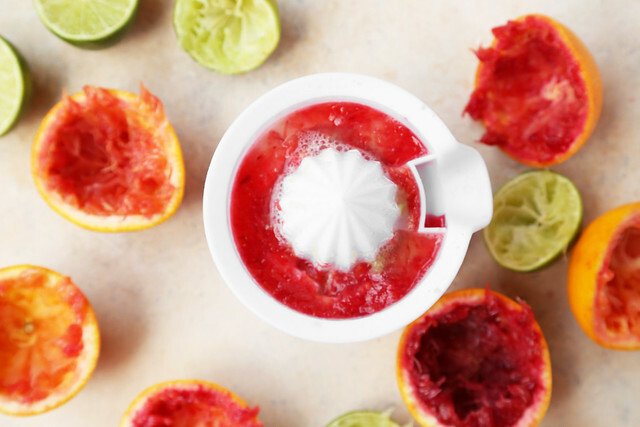 If you want, you can fill them up just shy of the top and then top them off with sparkling water or club soda, for a little bit of fizz. 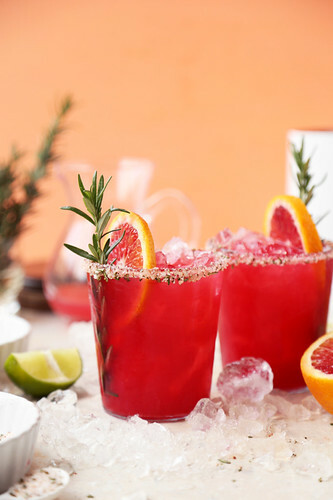 Garnish each cocktail with a slice of blood orange, and a sprig of fresh rosemary. So these aren’t super strong, hitting you over the head, with the rosemary flavor. I feel like when using herbs for cocktails, you should keep them minimal. That’s my rule of thumb. 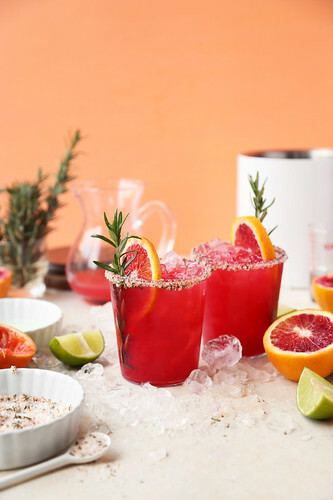 So by adding the chopped rosemary to the rim and the fresh sprig in the glass to swirl it around, that’ll give us just the right amount of rosemary taste that pairs so perfectly well with the blood orange. 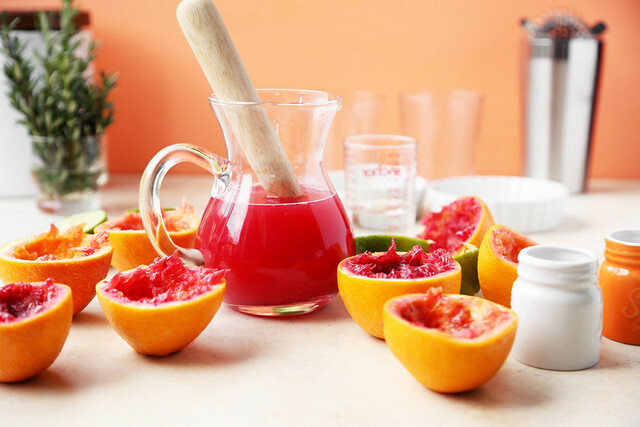 This is a great party cocktail because you can make a big batch of this and keep it in a large pitcher (or in one of those party water dispenser glass things) and then have people just serve themselves. You can make the mixture in the morning and keep in the fridge, well covered, until dinner. Just make sure to give it a good stir before serving. 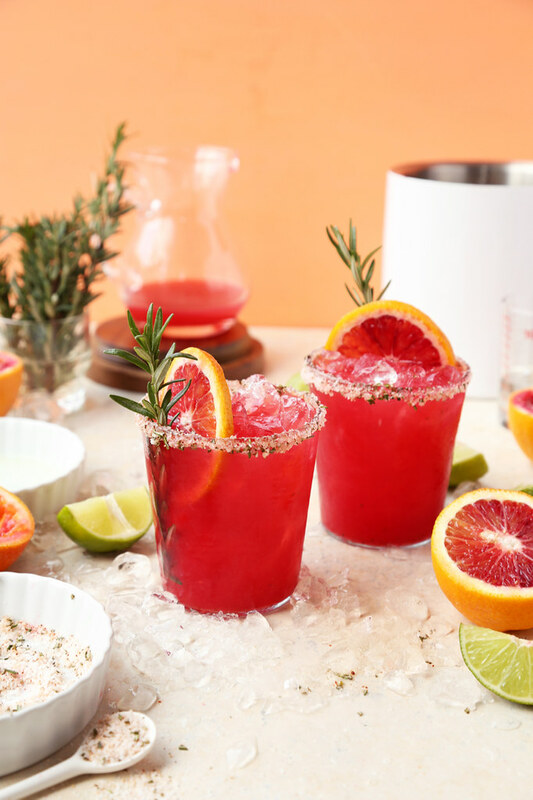 Let’s get the weekend started with these Blood Orange Margaritas. Remember that day drinking is totally acceptable when you’re not doing it alone and it’s paired with a delicious lunch or delicious appetizers to graze through. 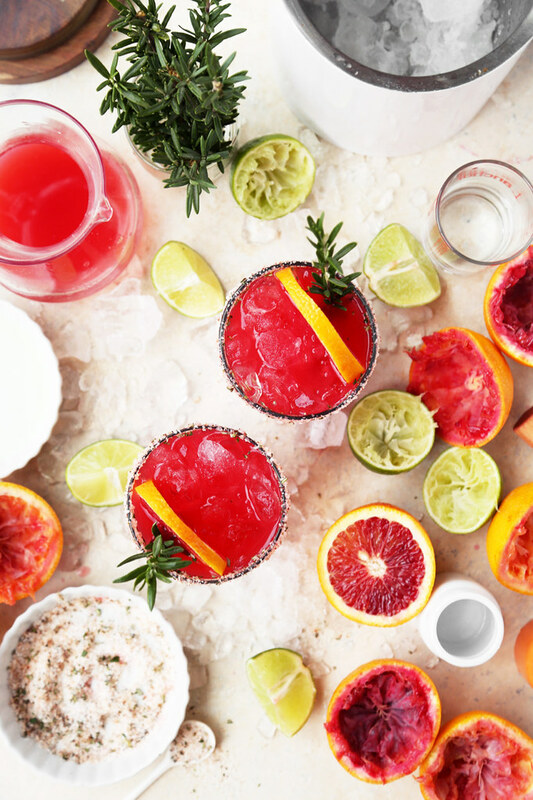 So let’s make a promise to each other that this weekend will be filled with margaritas, food, and good times. 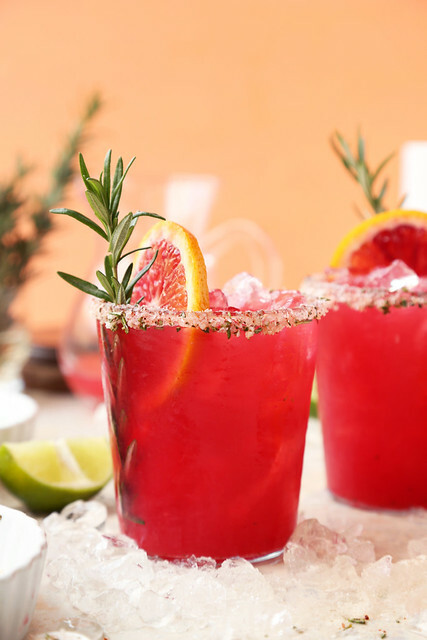 Get your Happy Hour on with these delicious Blood Orange Rosemary Margaritas! 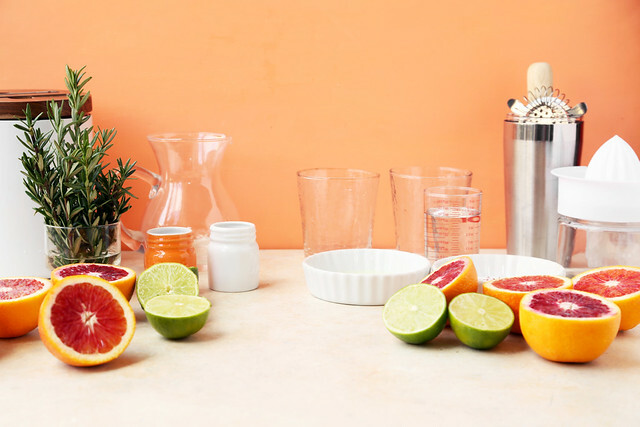 Fresh blood orange juice mixed with tequila and orange liqueur. In a small shallow dish, combine the salt, rosemary, and cayenne pepper. 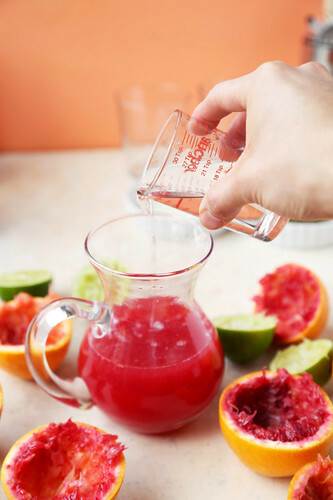 Pour the lime juice into a separate small dish. 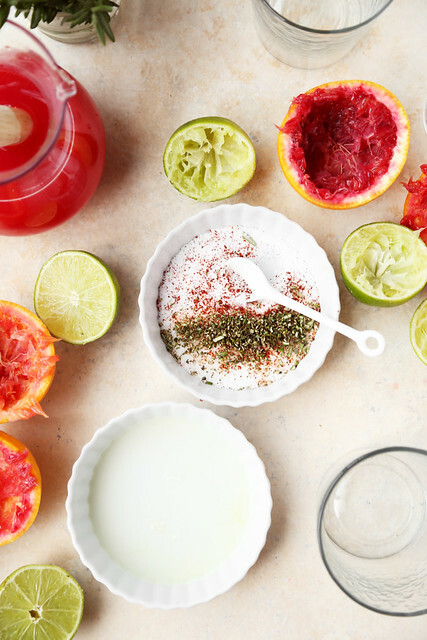 Dip each glass upside down into the lime juice and then into the salt mixture, set aside. 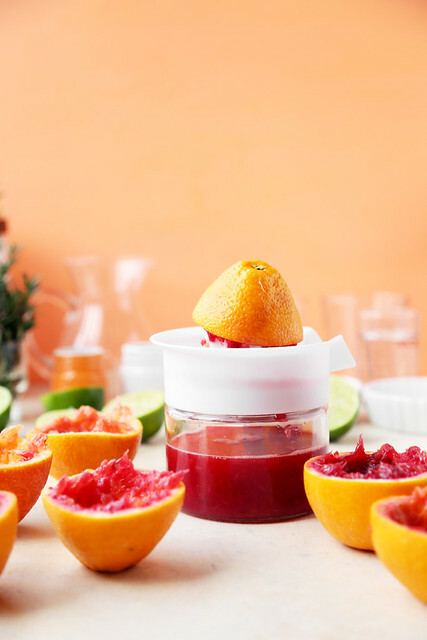 Strain the blood orange juice with a fine mesh sieve into a large pitcher. Add the lime juice, tequila, triple sec and simple syrup (if using). Give it a good stir until evenly combined. 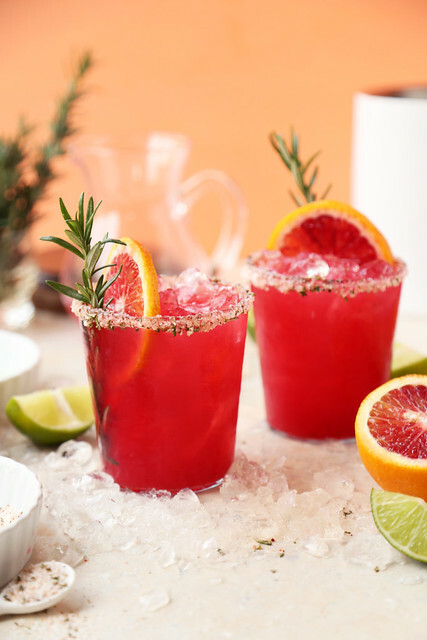 Fill each of the rimmed glasses with ice and then divide the margarita mix evenly among each glass. 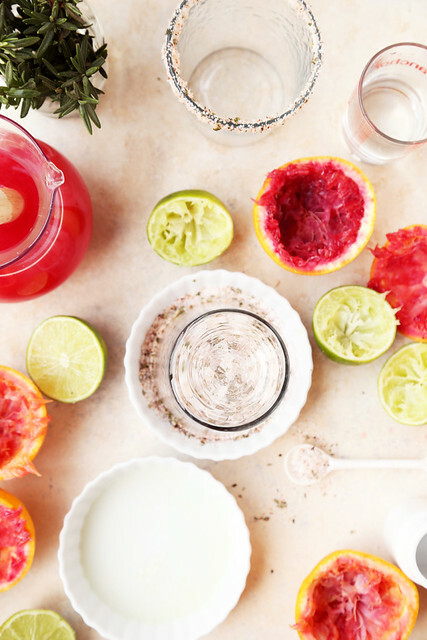 Garnish with a blood orange slice and a small sprig of rosemary. Enjoy! Make it a double please!! 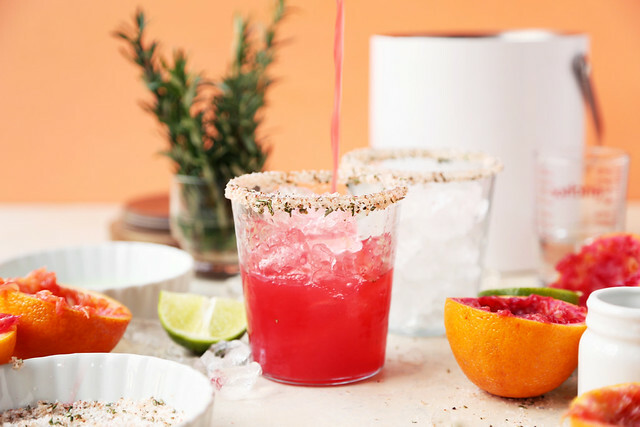 Wow these drinks are inspiring me to make it Mexican this weekend. Olé Thank you. The best Margarita I had was a prickly pear margarita at the JW Marriott Starr Pass, Tucson, AZ. Pool side the view is amazing! These were so delicious!! I almost cried when I realized we only had enough tequila for 2 drinks, so had to get more the next day to finish off our mix. 🙂 Loved them! I love love love that first photo, so so beautiful!! gorgeous colors! Thank you so much Desi!